The Flight is the perfect backpack for anyone on the go. 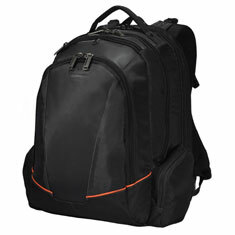 The backpack easily fits up to a 16in laptop in its ultra-soft padded and felt lined rear compartment that folds 180 degrees open for easy access. Even with a full load, the Flight keeps your back and shoulders comfortable with its deep airflow channels. Balance is also maintained, thanks to the Flight's 5-point balance strap system with a fully adjustable chest strap.